Mama Mo Stamps: WPlus9 April Release Day! All of the April release goodies are now available for purchase at WPlus9.com! There is a huge variety of new products that you are sure to love. I have one more project to share with you today featuring the Freehand Florals stamp set that was based on the work of Dawn's beautiful illustrations. 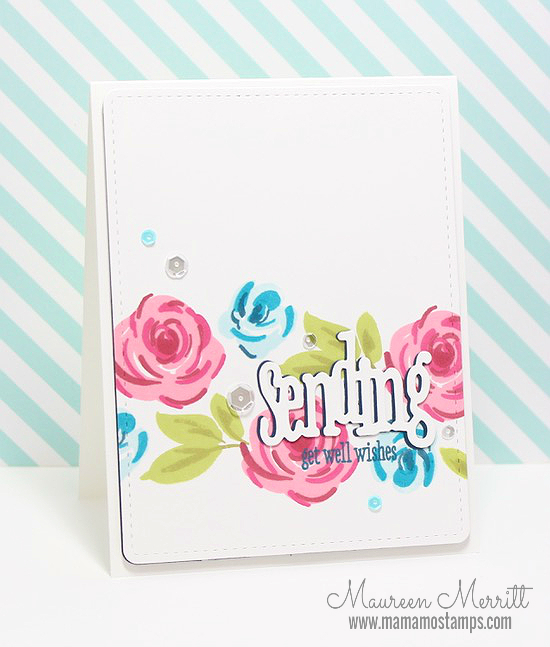 No one does floral stamp sets like Dawn! Each set is unique and beautiful. Freehand Florals is among my favorites from the WPlus9 line. I love the detail and layering possibilities. Dawn posted an intro video for this set on the WPlus9 Design blog. You can view that here. The loose design of the images allows you not to HAVE to line everything up perfectly when stamping, but when using the companion dies, it can be a bit tricky. So make sure you watch Dawn's video. I really wanted to make a simple card that shows off these images. 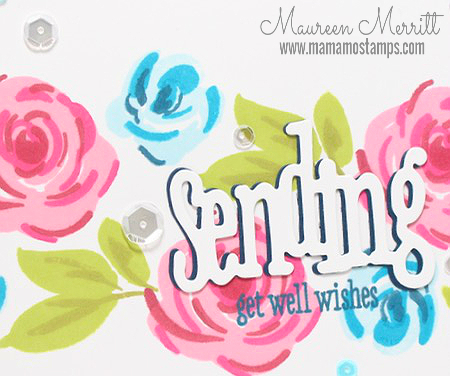 To make this card, I layered the images in shades of the same color along the bottom third of my card and then added a layered sentiment from the newly released Sending Hoping Wishing die set. The sentiment is from the companion stamp set, one that will become a staple in my collection. I added a die cut piece of Nautical Navy cardstock behind my stamped layer (a trick I learned from Kara) before adding it to a white card base. I have a friend that is recovering from surgery and this card is headed over to her house today. I just know it will brighten her spirits! Have fun shopping the new release products and thanks so much for spending a part of your day with me! This is a beautiful card Maureen. Just lovely! I agree, this is a stunning set that Dawn has designed. I watched the vid. when it was posted the other day and fell in love with the set immediately! Gorgeous! Love this stamp set! Very stunning card! Love the card design as well as color combination. Hi Mo ~ Gorgeous card, as always. Love your color choices and design with the white space. Thanks for sharing your talent with the rest of us paper crafters.